Finally back to oil pastels, a few more snow paintings for this winter. Quiet snowy pathways seem to give us a sense of solitude – here is my contribution to a calming peace throughout. 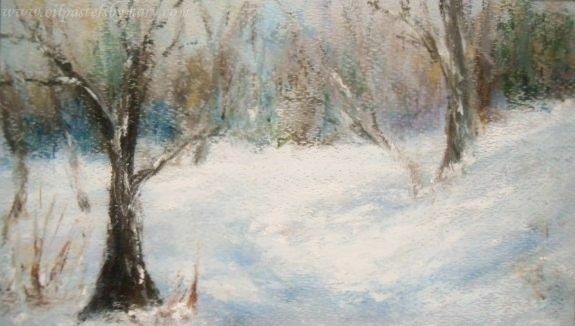 Winter Walk, (6×9) an oil pastel painted on light gray tinted Mi-Teintes pastel paper. Oil pastels used were Senneliers, Holbeins and Mungyo. A lot of scraping with a razor to blend and move the OPs around the surface. This entry was posted in About Oil Pastels, OPs New Paintings and tagged Oil Pastel, painting, snow, winter. Bookmark the permalink. Mary, I would love private lessons. Very nice! Hi Catherine, thank you for the compliment – still finding my way through the world of art. Snowy scenes, characterizes much of what I saw growing up and when I lived in the Northeast. There is something awe-inspiring about hushed winter scenes. Thanks so much – have a great weekend. Hi Karen, there is no better a compliment than for you to start painting in oil pastels again – oh yes I hope you get the old OPs out and have yourself a ball. Thank you so much and I’m hoping to see your new paintings. I am chilled looking at your painting, outstanding! I love the winter beauty of this painting. If it looked like that near me, I probably wouldn’t mind it so much. So funny, I agree with you – I like viewing snow from afar. Thank you Frank – have a wonderful week. The subtle color of this is so pretty! Thank you Elizabeth! Have a wonderful week. Your work just gets better than better Mary. Such beauty you’ve expressed in this painting. Thanks Emily, you are so generous in your comments. Hope you feel better, life for you in the coming week is for taking it easy. I know this sounds like a strange thing to say…but I can almost smell the crisp air in this painting, and how it invigorating it would feel in your lungs. Also, what a perfect location for a snowball fight, with all those trees to duck behind. What a great description – thank you so much for visiting and nice to meet you! What a lot of colour you did employ in a snow scene. I especially responded to the greens/blues on opposite sides with the random hints of golds across the backdrop. Wonderful! Hi A! Thank you so much, the bits of color were fun give just hints of warmth to a cold scene. Have a great week. Thank you so much Jacqueline – I really appreciate it. Thank you Rhonda, glad you enjoyed the painting. Wish I could see it, we are very cold but no snow. You are lucky, bet it’s beautiful. Thanks very much Elena – I have one or two more winter scenes slated before I switch gears. This is beautiful, Mary. It reminds me of the cold and the powdery snow we have been having here, in Indiana. It is being tossed and blown and such gray skies. I also like the textural feel of this. Thanks very much Leslie – the razor helped with finding the textures, it’s a great tool to use with oil pastels. We don’t have the white stuff right now, like you guys but the cold has found its way down here to TX. Stay warm and thanks, glad you enjoyed the piece. Calming indeed, sometimes winter feels like life in slow motion! Lovely scene Mary, nice to see some snow, we haven’t had snow yet this winter compared to some other parts where they got more then enough! Keep it warm and safe and have a great weekend! HI Eva, ah winter – snow and ice – we might have some ice this weekend. But the painting was from years past in Maine (backyard) where snow what such a part of life, beautiful and lasted for way too long in a cold season. Every now and then I kind of wish to see some of that white stuff and think, nah not really. Thanks so much and hope you have a lovely weekend as well. Thanks Rex, nice to see you again. Happy New Year! Thank you Nia – have fun taking more of your beautiful photographs! Thanks Fiona ~ have a lovely weekend. Oh I love this so much, Mary! Gorgeous work. Thanks Patsy, glad you enjoyed the piece! Hi John, thanks very much – a lot of razor scraping to bring about the look of a backwoods. Enjoy your weekend! It almost makes me feel festive, Mary! Wonderful stuff. I wish we could have some of that kind of weather, not seen the white stuff for a couple of years now. Thanks Steven ~ I like looking at snow, but the cold is something else entirely. Have a lovely weekend. Thank you so much Karen – have a lovely weekend, wish I had some heat right about now! Thanks Marina, you are so kind. Yesterday morning I scraped most of this painting w/my razor to see what would be revealed, and the technique rarely disappoints – that’s what makes this medium fun. Hope you have a wonderful weekend! Thank you Kerry – have a lovely weekend! Hope you are well.